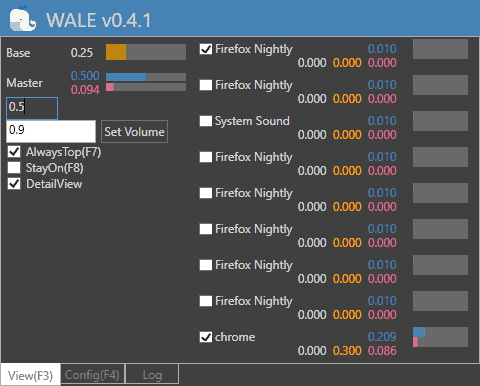 Wale, which stands for Windows Audio Loudness Equalizer, is a free open source software program for Windows to normalize Windows audio levels. Did you ever run into audio playback issues that caused the volume of audio to be too loud in application and not nearly loud enough in another? Or audio issues on the same site when you play different videos? While you can use the volume slider on websites, the native volume controls for applications that Windows provides to change the audio level or speaker volume controls, having to do so regularly is not overly comfortable. Windows Audio Loudness Equalizer attempts to fix the issue by adjusting audio playback while it is active on the Windows PC. The program interface looks intimidating at first, and even more so if you are not familiar with certain audio-related terms. Note: Windows may throw a smartscreen warning when you try to install the program on the Windows PC. A scan on Virustotal came up negative except for one antivirus engine that reported a hit (Qihoo-360). A portable version is also available. Wale adds an icon to the system tray area that you need to interact with to configure it. A double-click opens the main interface which is divided into the three tabs View, Config, and Log. View displays information about running processes that play audio for the most part and some general audio related information. You may want to switch to Config on first start to configure base parameters; some of these may intimidate you even further but it is just a matter of trial and error to get the configuration right. The program has a "return to default" button to restore the program defaults. What you may want to do is verify that the base level is set correct. Volume will be louder if you increase the base level and quieter if you decrease it. You will notice that Wale adjusts the volume of application's that play audio automatically. The volume slider may adjust itself multiple times or even all the time to find the right playback level for audio. 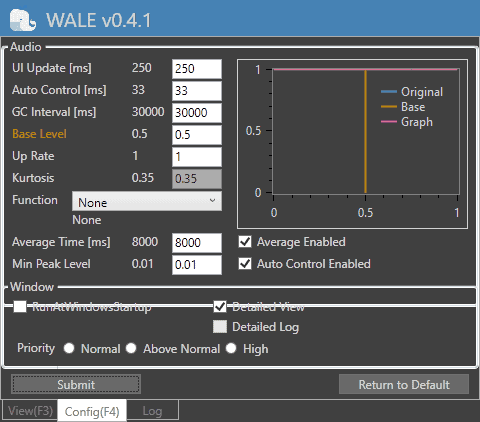 Wale supports a handful of additional configuration options: you may use them to set the process priority, update intervals and other variables. Windows Audio Loudness Equalizer attempts to keep the volume of any audio playing on the Windows device it runs on in user defined levels. If you encounter too loud or too quiet audio often, even while using a single application, you may want to give it a try to improve your experience. EarTrumpet does a pretty good job for me. Is it changing the volume in real-time? May be overkill for some situations, obviously. Eartrumpet has individual app settings on the tray icon without all the extra “stuff” wale provides. IMHO, that’s all I really need. The keyboard of my desktop PC a 3 volume keys (+, – and mute). My older one had not. Now I can say that I can’t do without these 3 keys. Whatever may happen – too loud, too soft, a phone call – I just need a finger and I’m done. To all pc keyboard makers, please put those 3 keys in ! Why install an app for something already in Windows? Open the Sound panel in Windows. Click Playback tab > click the option you want. I clicked Speakers. Then click properties. Then the Enhancement tab. Select the Equalizer and Loudness Equalization options. I have it in Windows 7 and 8.1. I don’t have 10 anymore. You’ll have to check for it yourself. Thanks, Martin, for this what looks like to be a ferry nifty program. For me, personly a program with many tweaking features needs a backup (and restore) setting possibility, does this Wale program has one? and even on their forums webpage, I could not find anything about this feature? Do you Martin (Or anybody else who know this) or there is a setting backup feature? I prefer Sound Lock ( https://www.3appes.com/sound-lock/ ) because of it’s simplicity. Really useful for watching stuff on sites like Pro7 where they set unskippable ads volume to almost twice compared to the rest of the video. It maybe also works with too quiet content…no idea, never tried. @phrozenghost–Ear Trumpet is highly rated and provides easily accessible volume controls for apps in the toolbar; I think, it basically replaces what “could have-should have” been already created. Sound Lock is another highly rated and often used program as is Volume2. Unfortunately, I need something that does it all: equalize/normalize each track in a playlist [without having to run a playlist through some other program]; and some program that works on a per app basis. In reality, I only run in to one problem with sound playing through a browser, and only one add-on that really works for me in Chrome. So when I stream Prime, I have to watch using Chrome; Firefox for Prime is a whisper, even with recommended add-ons; and on all my computers it’s the same. One of those oddities, I suppose. Good find, Martin! Why use this when Windows already come with it built-in? Also, most computers now a day come with some branded EQ (and probably powered by Realtek HD Audio) that has volume leveler turned on by default. I installed it on up to date windows 10 pc. Lost all sound immediately. Uninstalled, still had no sound. Had to restore to a backup to get sound back. While I had it, I noticed that portable apps were not listed in the menu of apps you could control.